Notes: This OAV was released just before the movie to build up hype for it. The characters are still based on the manga by Shigeno Shuichi but the storyline is new. Note that the reviewer cannot read Chinese subtitles. Mako has been feeling down since the recent events with Iketani, and Sayuki can see it in her lackluster driving. But as if on cue, some members of the legendary Emperor racing team show up in Usui right after defeating the Night Kids on their home ground. Will Mako and Sayuki be able to meet this challenge to their honor? Will Mako be able to regain her skills? Will this be enough to pacify the horde of drift-hungry Initial D fans? You've heard them all - the jokes, puns and horror stories of women drivers. Now I'm not saying that women drivers are bad or anything, but after you see this, you'll think twice about calling them lousy. Fans of Initial D will instantly recognize the blue Sil80 of Mako and Sayuki, the fastest racers in Usui. Working as a pair, they managed to defeat almost all the idiotic men that cross their path and look down on them for being women. This time, they face a new challenge - two members of the Emperor racing team, brandishing their shiny LanEvos and looking for new prey. The focus has been shifted away from Takumi and gang, and the plot of this OAV takes place just after the events of the First Stage. In fact, it probably runs concurrently to the Second Stage since these members of Emperor are not the ones that appear in Gunma to challenge the Speed Stars. That's probably the only way to go, since they wouldn't have wanted to mess with the main storyline right before the movie's release. If you've seen any bit of Initial D, you'll know what this is about. There's a big race between the Sil80 and a LanEvo, with some filler scenes between - it doesn't get any simpler than that. With the girls as main characters, you get to see more fan service shots and a couple of sexist comments thrown around, and there's even the introduction of a possible love interest for Mako. To be honest, I never liked Shigeno Shuichi's original character designs, but they still look better than the new style introduced in the Second Stage. The Extra Stage follows that same style - the guys and backgrounds look okay, but the two girls look absolutely ugly, to the point of looking ganguro in a certain scene. For a title that's supposed to showcase two beautiful racer girls burning rubber, it feels more like watching Barney the purple dinosaur advertising a fitness spa. Fortunately, we still get the same exciting car races like in the first two seasons. While there is some semblance of a good racing plot here, the overall pacing is weak because the climactic car battle takes place in the *middle*, and after than it just goes downhill. Only fans of the first stage will be able to appreciate the exploration of the two girls' characters, and the car race will not be able to create new Initial D fans this time. Though the intro and ending music are pounding dance numbers, they pale in comparison to the other move songs. The race soundtrack also fails to evoke the excitement that fans would expect from an Initial D work. 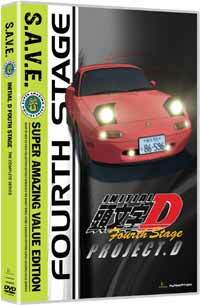 As mentioned before, this is the run-up to the Initial D movie so the producers probably didn't want to top the movie with this OAV. Unfortunately, it doesn't seem like a very wholehearted effort to dangle the Initial D carrot above uninterested anime fans. Recommended Audience: Only teens and above would enjoy stuff like this (except my 6-year old cousin, who loves Hot Wheels toys). There's a bath scene or two, some chest-gazing, and a little Boing or two. Aside from dangerous driving, there's nothing really objectionable here.